When I was in highschool, I didn't worry to much on how I look. I just used Johnson's baby powder on my face then pony tailed my hair and that's it, off I go to school. If it's Friday, it means it's our CAT day (ROTC in college). We are required to wear white barrettes and hairnet before we form our line in our respective groups. When that time comes, I always asked my classmates to help me put the barrettes on my hair and hairnet....funny as it maybe I really don't know how to fix up my hair. Then here comes college, still I'm used to the ponytail look and of course the ever reliable Johnson's baby powder. An improvement is that I'm always have a hairbrush or comb in my bag. And also I started to put hairclips during my junior year...hehehehe. And that's it. I'm not into face powder or even lipstick. My skin tends to have rashes when I'm using face powder and I don't like the taste of lipstick (yeah I know that you shouldn't eat it) but there are times where I accidentally taste it. That's me until I graduated from college. When I started working, I'm still using Johnsons, pony tail look, sometimes I have hairclips, hairbrush/comb and mirror (yeah, an improvement in a must haves department =P ). Then I noticed my friend using an eyeliner...hmmm...it does wonders to her eyes. So it made me think if I could try having one. So I did purchase one. At first, I'm having trouble using it but as time goes by I get the hang of it and I love it! I always tell this to my friends that whoever invented the eyeliner should be given an award! Ahahahaha! The eyeliner makes my eyes more alive especially if I'm on the sleepy edge. Then I was introduced in using lipgloss. Yup! It was probably in the year 2004 when I started using lipgloss/lip balm. Up to now, I'm still using it because it helps me prevent having chapped lips. Then around 2005, a good friend of mine introduced me the "eye concealer". During that time, it's a must to have an eye concealer since I'm working on a call center and we are always on the graveyard shift. Only problem is that my dearest sister, "borrowed" my concealer and she never returned it. After that, I didn't bother to buy one. I'm not even sure why I didn't. 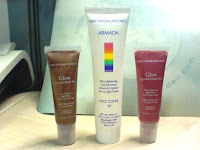 Now in 2008, my dearest colleagues here in the office (btw, I'm not in a call center anymore) introduced me to using lip and cheek tint. Actually I have one before which is an Avon brand but I used it for my lips only. This time, the lip and cheek tint that I purchased, I'm using it on my cheeks :) It's a VMV product and it only cost me 80 pesos! Nice catch huh?! :) It is metallic bronze then I purchased another lip & cheek tint, also a VMV for 110 pesos which is color light pink :) I decided to used cheek tint just to add a little bit of color in my face...hehehehe. Aside from that, I also purchased the VMV Armada Face Cover. According to the feedbacks, it's a non-greasy formula which protects your face from UVA, UVB, Infrared and Visible light from the sun. It also helps prevent melasma (dark blotches), photoageing and skin cancer. Sounds like a DIVINE product eh?! I got it for 300 pesos only. All of these happened just this month! (Surprise! Surprise! =P). Special thanks to my deary officemate Rod for selling me the VMV products at a low cost (they are authentic VMV). I enjoy making this blog entry. It made me realize na there will be times that you need make-up...hehehe.